Many people don't know it, but installing or removing a dome is actually extremely dangerous. It requires a team working together to constantly balance the heavy load of the dome properly so it doesn't buckle or break free of its anchors, possibly hurting someone or worse. Ash has had many installations and removals over the years, and safety is our top priority with these projects. If you are removing a dome, Ash might be interested in giving you a credit for it, or we might know someone who wants to purchase it from you. So be sure to call or email one of us, to see if we can help find it a home. Tired of seeing dust bunnies, cobwebs, water stains, spit wads, and other annoyance on your dome which you can't reach with just a broom and a ladder? Or you're worried you might make it look way worse than before? Who ya gonna call? Dust-Busters? Naw, just call Ash and we will do all the work so you don't have to worry about it. If you're purchasing a new bright digital projection system, you probably were told you will need to have your dome painted as well. The reflectivity of the dome will need to be reduced, so that you don't have 2 moons on opposite sides of the dome. 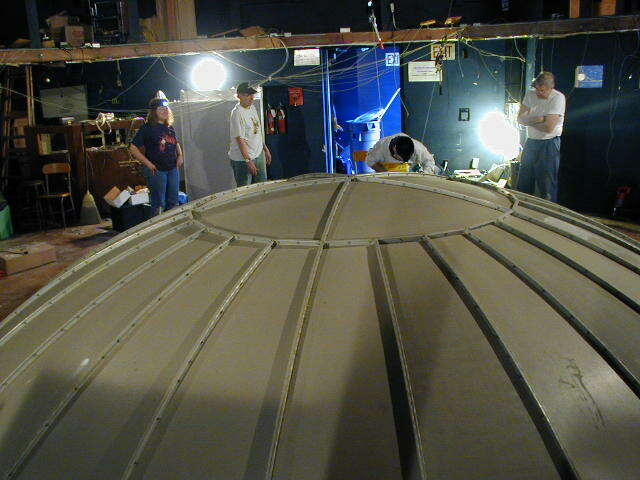 Ash has repaired and painted countless fiberglass and aluminum domes. We give old domes a new lease on life, at an unbeatable price, for those older planetariums.